FILE - Turkey's President Recep Tayyip Erdogan talks to supporters of his ruling Justice and Development Party during an event to announce the party's "manifesto" ahead of countrywide local elections scheduled for March 31, in Ankara, Jan. 31, 2019. Turkish President Recep Tayyip Erdogan is accusing Washington of "imperialism" in its efforts to oust Venezuelan President Nicolas Maduro. Erdogan's latest verbal salvo in support of his ally Maduro came amid growing U.S. pressure on Ankara to end support for the beleaguered Venezuelan leader. "Is Venezuela your instrument?" said Erdogan, chiding U.S. President Donald Trump in an address to his parliamentary deputies Tuesday. "Their president came through elections. What right do you have to appoint another? And where is democracy? How can this be accepted? "We do not accept the world where the one who is stronger is right. We are against such an imperialist position," Erdogan added to rapturous applause from his deputies and cheering supporters. With both Washington and the European Union recognizing Venezuelan opposition leader Juan Guaido as the interim president, Erdogan's strong backing of Maduro puts him on a collision course with his Western allies. "I think the issue [for Turkey] is a matter of principle rather than geopolitical factors," said international relations professor Serhat Guvenc of Istanbul's Kadir Has University. "Turkey does not approve of the idea of regime changes in sovereign countries," he added. "So, they clash with the U.S., in terms of principle. Turkey is in the league of Russia and China, and these countries value sovereignty above all else." FILE - Venezuela's President Nicolas Maduro and first lady Cilia Flores acknowledge supporters at the end of a rally in Caracas, Venezuela, Feb. 2, 2019. Maduro's opponents accuse him of undermining democracy and presiding over skyrocketing inflation and a collapsing economy. Ankara's support of Maduro extends far beyond rhetoric. Turkey is processing large amounts of Venezuelan gold. Last year, Caracas exported nearly $900 million worth of gold to Turkey. The trade provides Maduro with a vital source of revenue in the face of tightening international sanctions. "Maduro is raiding the gold reserves of Venezuela to generate cash. He has already stolen at least 10 percent of total reserves in the last week," U.S. Sen. Marco Rubio, a Florida Republican, tweeted Friday. "I hope the UAE & Turkey will not be accomplices in this outrageous crime. Any companies that are involved will face U.S. sanctions." News reports say Washington is urging Ankara to stop its Venezuelan gold trade. Analysts say adding to U.S. officials' concerns is the suspicion of some that the Venezuelan gold may end up Iran, violating U.S.-Iranian sanctions. "Turkey is duly warned by Washington over this gold deal," said political scientist Cengiz Aktar. "But I don't think Turkey can play with the big boys of China and Russia to support the Maduro regime, because Turkey will be forced to step back." Ankara has painful experience with U.S. sanctions. Last year, the Turkish currency collapsed after Trump hit Ankara with sanctions over Turkey's detention of American pastor Andrew Brunson, who has since been released. Although the sanctions lasted only a few weeks, Turkey's economy is now facing a recession. "Up to a point, you may afford to have a deterioration in your relations with the world's most powerful country, but there is certainly a limit," said Guvenc. "Turkey has tested those limits and now knows what those limits are, so we will probably see a moderation in Turkey's position." Any step back by Ankara over Venezuela may not be immediate. Turkey holds critical and hotly contested local elections in March. A tough stance toward Washington, analysts point out, plays well with Erdogan's core religious and nationalist constituents. "Things may get complicated [with the U.S.] in the short term," said international relations expert Esra Akgemci of Turkey's Selcuk University. "But I don't think things will end up with a serious rupture in Turkey-U.S. relations. It means that Turkey's support to Venezuela will be restricted." Some analysts explain Erdogan's strong backing of Maduro by pointing to his personal experiences. In 2013, nationwide anti-government demonstrations, dubbed the Gezi Park protests, nearly ousted Erdogan from power as the then-prime minister. "Having gone through the experience of the Gezi Park protests," said Guvenc, "it's only natural to view such [Venezuelan] street protests through the prism of his personal experience in Turkey. He [Erdogan] is viewing those protests with a certain degree of suspicion. "The government and Erdogan have shown [in the past] and repeatedly said they will use every means at their disposal to suppress any such protests in Turkey in the future," Guvenc added. 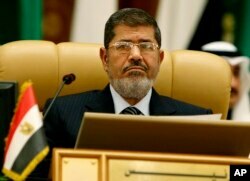 FILE - Then-President Mohamed Morsi of Egypt attends the third session of the Arab Economic Summit, in Riyadh, Saudi Arabia, Jan. 21, 2013. Erdogan's suspicion of anti-government protests is heightened by the overthrow of his close ally, Egyptian President Mohamed Morsi. Mass demonstrations in 2013 were the catalyst for then-Gen. Abdel-Fattah el-Sissi's seizure of power through a coup. "When Sissi overthrew Morsi, Erdogan took it personally," said Aktar. "So, probably as far Maduro is concerned, another Erdogan ally, all this international pressure on Maduro and protests, Erdogan is taking it personally as well. This is clear." Erdogan accuses Washington and other foreign powers of engineering Morsi's downfall, along with the current protests in Venezuela. Elements of Turkish pro-government media are already claiming Turkey could be Washington's next target.